All "build your own" plans that include voice minutes now also include unlimited texts. Prices for 2 GB and smaller data bundles have increased. The prices of the 3 GB bundle has decreased and the $45 5 GB bundle has been replaced by a $39 10 GB one. Voice minutes pricing has gotten really complicated with the prices of minute bundles varying depending on whether or not your plan also includes a data bundle. The price for unlimited minutes also depends on how much data you include. Build you own plans are already hard enough to understand. I don't think Tello did itself or its users any favors by making them even more complicated. Fortunately, the Tello site includes an easy to use calculator that lets you choose voice and data amounts and shows you the combined price. The good news is that most build your own plans are now less expensive, including any combination that includes unlimited texts and/or unlimited minutes. Data only plans of 3 GB or more are also cheaper. Prices increased only for non-unlimited voice-only users and for data-only users with plans of 2 GB or less. Here are some sample plans showing old and new prices. 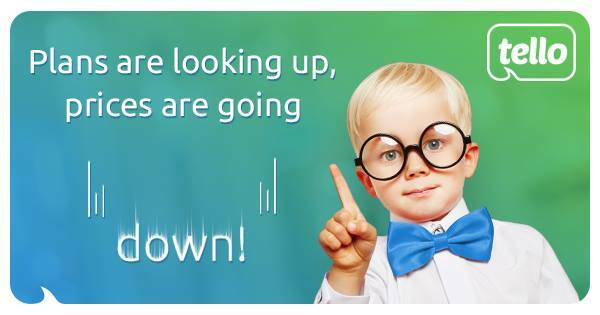 Tello has migrated existing customers to the new plans, with no price increases for them. They are paying the same or less and getting the same plan or a plan with even more minutes and data along with unlimited texts. For example, users who had a plan with no texts or 200 texts have been switched to unlimited texts for the same price, and they will remain at this price as long as auto-renewal is active. Calls to Mexico and Canada are included at no extra charge on build your own plans. MMS are charged based on the amount of data. All build your own data bundles include unlimited 64 Kbps throttled data after the high speed data allotment is used up. Hotspot is allowed on all plans. Tello plan prices do not include taxes and fees. There are no changes to Tello's Pay As You Go plan. PayGo rates are 3¢/minute, 1¢/text and 2¢/MB. The minimum top-up is $10 and PayGo balances do not expire as long as a call, text, data usage or top-up occurs at least once every three months. Updated 11/22: Custom plans without voice minutes no longer include unlimited texts. Stupid comment considering tello doesn't have yearly plans. It's not stupid at all. Tello's PayGo plan can easily cost less than $20 a year. on one tello line for my niece, had $4 data (200mb at 4G LTE and unlimited slow data afterwards) + $3 sms texts (unlimited). so that was a plan at $7 total per month. now it's changed by tello to a "custom" plan of only the $4 data monthly plus the free unlimited sms texts. (also have an $18+ balance on this line just for voice calls (3¢ per minute).) so really a four buck "custom" plan and it says it will renew at the $4 amount. so it must be grandfathered but now discounted. tello must have taken great consideration to set "custom" plans for those with lines like this. bravo to tello for their generous consideration. also on my sister's tello line, it was $4 data + $2 sms (200 txts) for a $6 monthly plan. now it's also just been changed by tello to a $4 "custom" plan for the data plus the free unlimited sms texts. (this line also has $14+ balance just for phone calls.) feel grateful they also set it up to allow the $4 "custom" grandfathered but discounted plan. thanks tello. have three other tello lines for me, my mom, and an extra house phone, with just $10 balances (more or less) for handling few pay-as-you-go random calls each month. now almost makes me wish had set these three other tello lines with monthly plans like as with the tello lines for my niece and sister. but that's okay because these three other tello lines, although very much needed by my family, are not as frequently used. I didn't know you could combine a custom plan with paygo rates. @Anon2306 That's Tello's big advantage - you don't have to pick either or, you can have the cost savings of prepaid plans with a paygo balance covering the occasional overages. Keeping an overage balance allows Tello to earn interest on that banked money and thus keep even their paygo prices cheaper than most. It's a very fair deal. If MintSIM weren't around, I'd probably be looking at Tello pretty strongly, with the big concern being the abysmal fallback data speed. I've used them for my kid's phone in the past and there were often timeouts with the data when throttled that went unnoticed because it was too slow to bother keeping an eye on. It was often just barely enough for Hangouts voice calls to work, but there were not infrequent hiccups. Personally, all I need is cheap unlimited data at a reasonable speed (no voice or texting needed as Hangouts or any of the many other VoIP & messaging solutions take care of that). Cricket's got the beginnings of the right idea, but their discount for their throttle is too insignificant. Data is way too overpriced given the incredibly poor state of Sprint's network. But can an MVNO really sustain itself on sub-$10 subscribers? That didn't wotk out so well for another Sprint MVNO called RingPlus. Ringplus charged a one time fee and then gave out massive amounts of data for almost free. MVNos can live off of sub $10 subs. They just need to be smart about it. RingPlus failed because 90% of their customers had completely free service. Tello doesn't have that problem. RingPlus failed because they did not meet the business goal they agreed to with Sprint to sign up 500,000 customer lines. That is what they thought it would take for the ad revenue model to be sustainable. R+ could only give away ~200K lines. 300K MORE free customers would have saved them. "RingPlus failed because..." its management made a lot of poor decisions and few good ones. You can't blame its customers (who did nothing more than sign up for offered services) or Sprint (other than the usual about Sprint having a poor-quality small unappealing network). Has anyone logged onto their RingPlus account recently? Mine is still there and seems to have been signed up for "Fluid Call." Maybe the RP zombie is going to return as a free sip provider? Would be nice if they did that. As much as I love what Google Voice provides I can't stand the constant change of direction and half-assed attention to what is one of the most important communication options. They said long ago that they were disassociating Hangouts with GV, but haven't made clear since just what they're going to do or when. I understand they need to be flexible and dynamic in a ridiculously fast-changing tech world, but regularly screwing with people's phone & messaging options is going to make people feel they are too unreliable to depend upon. I believe I read that the three months has been reduced to 60 days. The Tello Terms of service page says "Pay As You Go credit is available for a period of 3 months since customer's last order or call, text or data session, effective September 1, 2017. If none of the actions mentioned above was carried out in a period of 3 months, SIM and Pay As You Go credit will not be available for calls." "100 minutes, 200 texts, 500 MB: was $13 now $9 with unlimited texts"
Was 200 texts for $2, unlimited for $3; now unlimited included with any voice or text plan "
This should end with: "...with any voice or data plan"
Free texts are a welcome change. But US Mobile has better data prices. But US Mobile has a $2 service fee that negates any advantage. From cursory examination, I don't think Tello pricing is lower overall. It's slightly higher. Tello appeals only for low-use, so the high-end price drops aren't relevant. The low-end is where the action is, at the 200/500/1024MB data and 100/200/300min voice brackets. Unlimited text is now bundled in with the +$2 increase for voice, so you are paying for "free" text whether you use it or not. Moreover, you are now "strongly persuaded" to buy data w/ voice, to get the price drop. But those drops are largely negated because data price also went up. It's a double whammy. From above, Tello is following TracFone's footstep in obfuscating its pricing and luring users to spend more than what they need. It's definitely not in favor of the user. Tello is still good for its PAYGO, assuming you're stuck with Sprint. I'd stay far away from its monthly plans with these changes. This should be added to the article. I don't see the pricing as significantly different overall. Tello just finally realized that with so many messaging apps out there (Facebook's Messenger, for example) they could no longer expect people to pay extra for texting and were losing money they thought they'd have when they designed their previous pricing structure. Look at the big picture and it's really not all that different. No surprise they raised the prices on their smaller data plans. It was a popular topic as RingPlus was closing, that the unlimited throttled data on Tello was fast enough for VoIP, so $5/mo for unlimited calls and texting as well as slow internet. Of course all would have been better suited going to FreedomPop instead, but enough foolish and cheap people jumped on Tello to make it inevitable they'd have to cut the feature or raise the price. Network matters as well. Can't compare prices fairly if the networks are different. Yeah... with Sprint-based Tello being on a network less than a third as good as Cricket's AT&T network, for example, Tello needs to price their service about 1/3 of what Cricket charges. 1. Cricket IS AT&T - owned outright. 2. The far better comparison of coverage is not necessarily physical coverage as a percentage of the nation, but as a percentage of where people actually are. Unless you travel a lot, Sprint's coverage can be perfectly fine for a lot of people. 3. There's a helluva lot more that goes into pricing considerations than "one-third the coverage at one-third the price." You're obviously not a businessman. 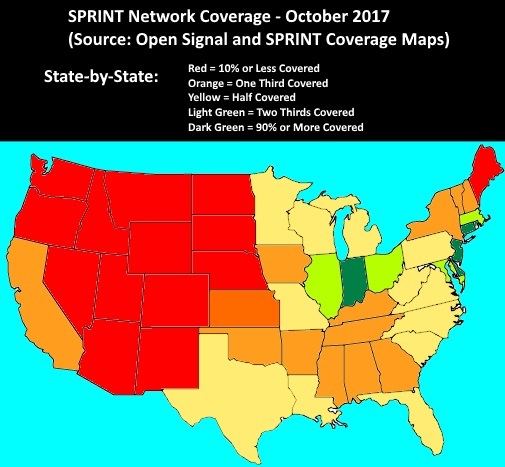 Out of this, it can be observed that coverage for ALL states west of the Mississippi on Sprint isn't good, with most states having extremely poor coverage, and even California is only a third covered. The situation is only a little bit better in the eastern half of the country, with only two areas of good Sprint coverage existing: the tiny states of the Atlantic seaboard but only from Massachusetts down to Maryland; and also Indiana and the two states flanking it. The limited coverage of Sprint is well known. It's also adequate for some users. Why do you feel the need to flood every Sprint related post on this blog with multiple comments telling us what we already know? 2. The far better comparison is actual... physical...coverage. Because Americans are everywhere. America is where "people actually are." Even if you travel a little, it is likely Sprint won't meet your needs. Let alone if you travel a lot. Because it's a small area of the United States actually has Sprint coverage. Sprint's rather small share of the cell customer Market is an exact reflection of how poor the coverage is. Sprint gives coverage to Americans in only a small part of the places they go. 3. No, I am not a marketing person who is paid to fib about everything. That's more accurate. I am not that Sprint guy who used to be with Verizon who says that Sprint is 99% as good as Verizon when it's really only about 1/3 as good. The companies that charge full price for something that is only a fraction is good really do end up suffering... Because their business model is not based on actually selling a satisfactory service, but in fooling as many people as possible. I'm not a businessman. But nor does it seem that the people that run Sprint are any sort of businessman either. That's why it's a dead horse. That's why the only hope for Sprint appears to be and some other company that actually knows how to run things taking it over. Slight change to the original change: unlimited texts only come with voice minutes. The 'build your own plan' page indicates this when selecting "no minutes" in comparison to other voice options. Not a big deal for me as I actually use voice minutes.